The Carl Jung company is rich with history, tradition and quality wine making. It was established in 1868 in Germany and housed in a castle in the Rhineland built in the 10/11th century. Today, Carl Jung Dealcoholized Wines utilize a process patented in 1908 that maintains the taste and characteristics of wine but removes the alcohol. The process of gently removing the alcohol is currently accomplished by the modern technique of vacuum distillation. 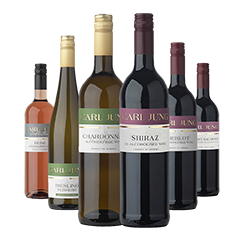 Carl Jung Wines exports 7 varieties of wines in 3 different sizes to over 25 countries throughout the world. 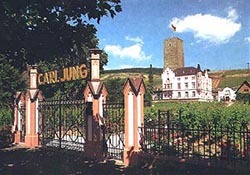 The CARL JUNG company was established in 1868 by Carl Jung, a wine grower and cooper. His father, Johann Jung, born in 1798, was a pilot on the Rhine bringing freight ships through the rapids of the "Binger Loch". In 1823 he married a young and fairly wealthy lady and soon after started to buy Riesling vineyards situated on the slopes of the river Rhine, that the young couple cultivated in their spare time. Carl Jung, born in 1841, in his formative years learned to make barrels and everything about wine-making before he decided to start his own business in 1868 by taking over the vineyards of his parents. He married in 1876 and his wife proved to be one of those rare business women of her time. While Carl Jung cultivated the vineyards and made the barrels for the new vintage, his wife Maria traveled all over Germany selling the wines of her husband mostly to customers like doctors, lawyers etc., people who could afford to drink wine, and usually ordered a year's supply at a time. It occurred to her more and more that she was losing out on orders from long-time customers who's doctors had forbidden them to drink wine because they suffered from ill health, weak heart, kidney trouble, liver inefficiencies. She thought to herself, "If there was only a way to extract the alcohol from the wine and at the same time, maintain" the flavor and all the taste values of real wine, I could offer these poor people an alternative so that they can enjoy the taste of wine without its alcoholic after effects." Carl Jung Jr., her son, still at University studying economics, started working on the idea of extracting alcohol from wine. By experimenting with the equipment at home soon found out that he had to apply a vacuum in order to cut down the distilling temperature below 35 degrees Celsius=95 degrees Fahrenheit (less than blood heat) and thus prevent a "cooked taste"; of the de-alcoholized wine. At the same time he discovered that the flavor of the wine was very volatile, more so than alcohol, and that it passed through the condenser without being condensed. The reason was the much lower boiling point of the flavours. Alcohol, at normal pressure (no vacuum) evaporates at about 80 centigrade (176 degrees Fahrenheit) flavours evaporate at room temperature. One can smell the flavours of wine in a glass as they evaporate from the glass at normal temperature. Realizing this, Carl Jung invented a device to recollect these very volatile flavours in a special aroma-column. After the de-alcoholization the flavors collected proved to be absolutely new, it was duly patented in 1908 in Germany as well as four other states including Great Britain (No. 7732, 9th July 1908) and USA (No. 1071 238, 26th August 1913). In all these years since 1908 the Carl Jung company has grown steadily, always striving to improve the quality of the product. New patents have been developed to turn the original de-alcoholization process thus making it more efficient. Today, the Carl Jung method of de-alcoholization represents the most advanced technique for quality production of the de-alcoholized wines, and the annual production is now measured in millions of litres. Carl Jung de-alcoholized wines are exported to more than 25 countries all over the word.